SSG Capital Advisors, LLC (“SSG”) acted as the exclusive investment banker to American Fuel Cell and Coated Fabrics Company (“Amfuel” or the “Company”) on its sale of substantially all of its assets to an affiliate of LB Advisors, LLC (“LB”) and Playa Capital Partners, LLC (“Playa”). The sale was effectuated through a Chapter 11 363 process in the U.S. Bankruptcy Court for the Northern District of Texas, Fort Worth Division. The transaction closed in November 2018. Amfuel, based in Magnolia, Arkansas, manufactures self-sealing, crash resistant aviation fuel cells and liquid logistic tank solutions. As one of two qualified aviation fuel cell manufacturers for U.S. Department of Defense aircraft, Amfuel maintains a significant competitive advantage over its smaller domestic competition. The Company utilizes complex, proprietary tooling and manufacturing processes to produce collapsible, flexible, rubberized fuel storage bladders that are crash resistant and provide ballistic protection qualities for military, commercial and general aviation aircraft (fixed-wing and rotary). In addition, Amfuel manufactures non-aviation, commercial liquid, multi-use storage containers that are designed for large volume and multi-use liquid transport of industrial chemicals, potable water, sewage or ground fuel storage. As a result of a relocation to and then from Texas, between 2016 and early 2018, Amfuel’s operations, liquidity and financial performance were adversely impacted. This precipitated the need for Amfuel to seek a restructuring of its finances and explore strategic alternatives. Ultimately, Amfuel filed for Chapter 11 bankruptcy protection in November 2017. SSG was retained by Amfuel in early 2018 to explore strategic alternatives, including a sale of its assets. SSG conducted a comprehensive marketing process, contacting investors, domestic and international private equity firms and potential strategic acquirers in order to generate the best outcome for the Company’s stakeholders. Ultimately, a sale to an affiliate of LB and Playa was determined to be the best alternative for Amfuel. LB Advisors, LLC is a Los Angeles based private equity firm that invests in recapitalizations, special situations and acquisitions of small and middle-market companies. 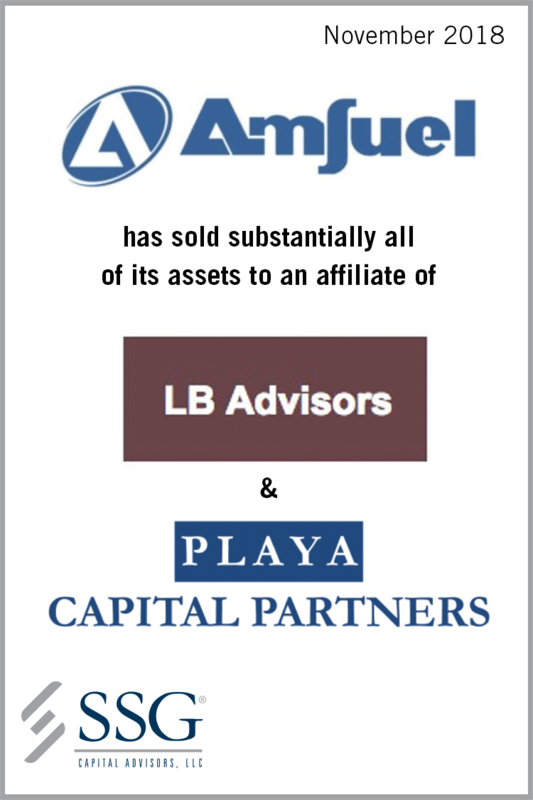 LB and Playa target investments are companies which are experiencing financial distress, undergoing or in need of an operational turnaround, and/or are misunderstood or undervalued by their stakeholders or the markets. •	Joshua N. Eppich of Bonds Ellis Eppich Schafer Jones LLP, counsel to LB Advisors, LLC.